A few months ago, I went on a photo walk with a friend up in San Francisco. We left Best Buy, where she had literally just pulled her new DSLR out of the box, and started wandering. After a couple blocks, we meandered into a motorcycle dealership. It had a fairly laid-back atmosphere; the doors and windows were wide open, there was Moto GP on the television, and it seemed like people were just hanging out and talking motorcycles. While my friend was talking with one of the employees, I got this photo. 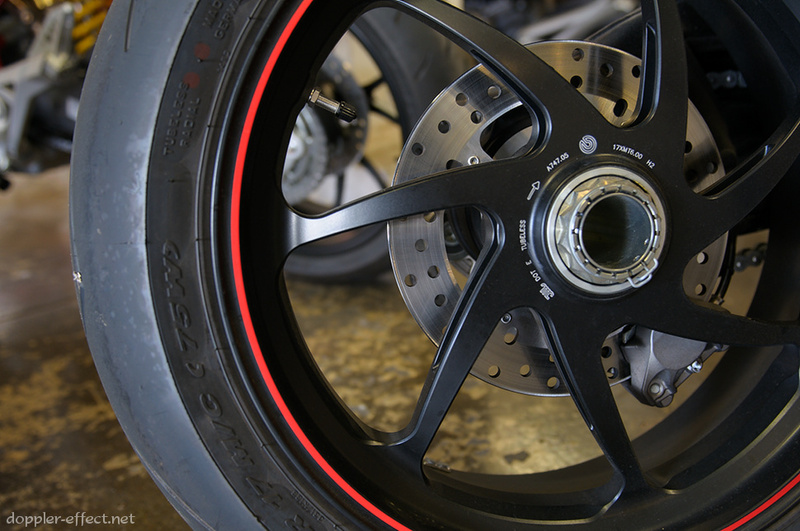 I was drawn by the red pinstripe on the rim, and I hadn't seen a one-sided swingarm in person before. One thing I've been practicing for a while is trying to capture smoke. I spotted this man's orange cap from a distance, then noticed the smoke curling up from his cigarette as I got closer. I stopped, took two quick frames, and kept moving. It wasn't until I was home that I noticed how little he fit into my mental model of the world. 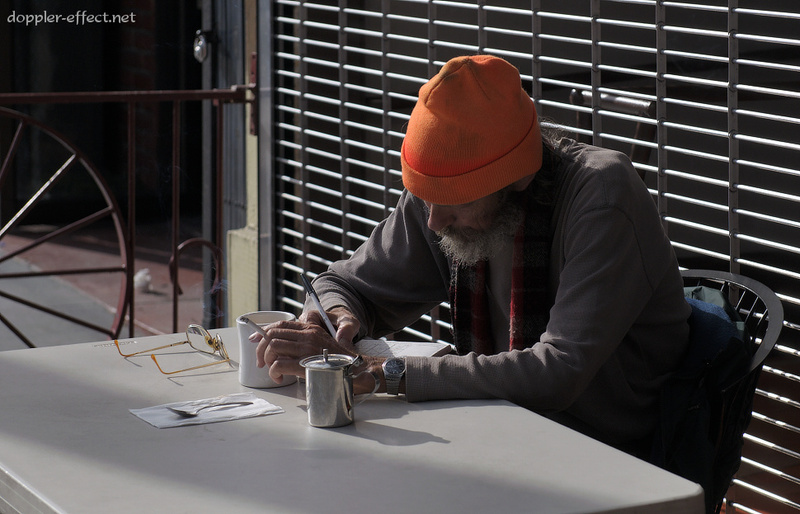 Seemingly homeless, but with glasses and a watch (though that pretty well for wear), he was sitting relaxedly at a cafe we walked past, having a smoke and some coffee/tea while working on a Sudoku puzzle. It made me wonder. What's this guy's story? What is a typical week for him? Thinking about it now, it seems obvious that most people who beg for money don't do so continuously. But it's interesting how it can seem that way until you think about it. A couple minutes later, my friend and I doubled back toward where we had come from, walking a block away from our original route. 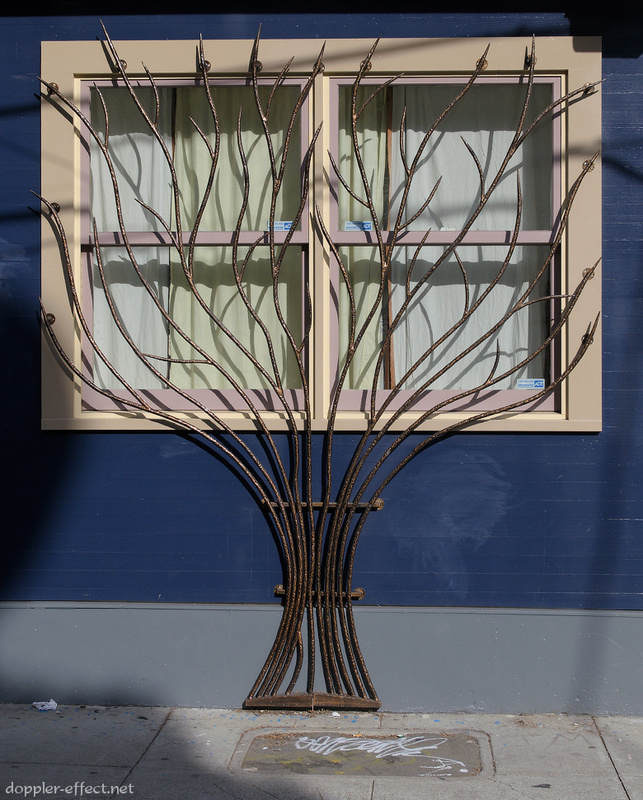 On our way back, we spotted this fantastic window grating before it was time to part ways. We hopped into a cab, and I hopped out at some point during the trip back to keep walking around and shooting. And it's a good thing I did. 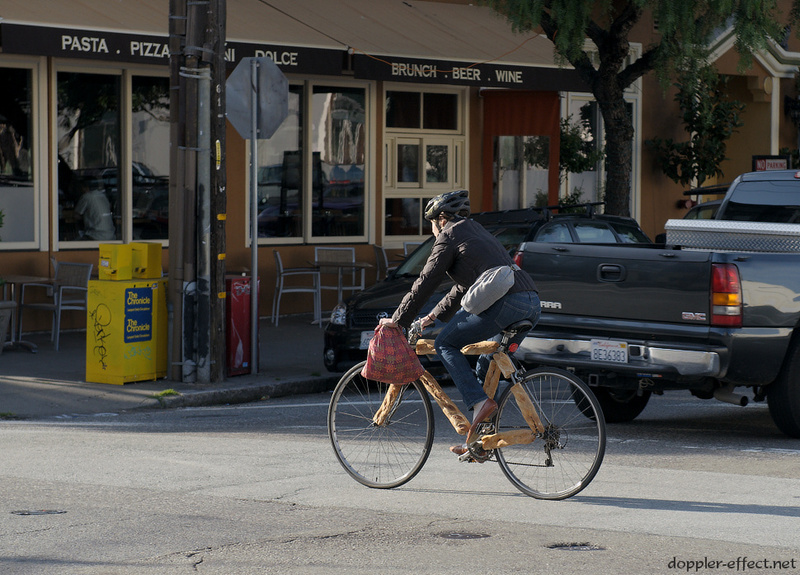 I've seen bikes with tubes made out of steel, aluminum, titanium, carbon fiber, even wood. But French bread? Admittedly, the rolls aren't load-bearing, but that makes them no less mystifying. Why bread? Why on your bike? How was it attached, and how long had it been there? Inquiring minds want to know. This was another unexpected sight. 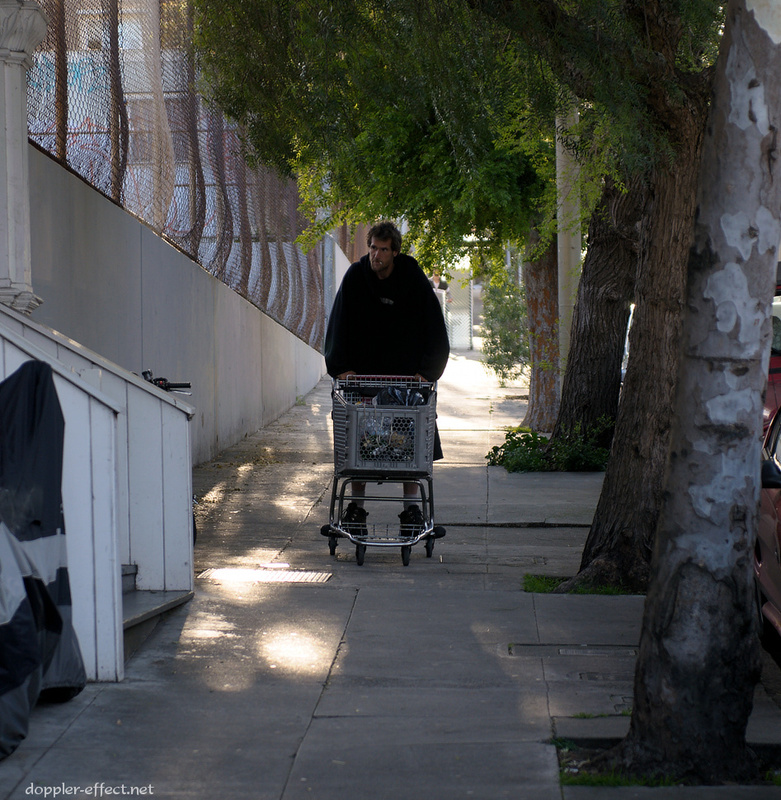 Most frequently, when I see a homeless person with a cart, the cart is decked with bags of cans and plastic bottles, and the person is either actively scavenging for more cans and bottles, or is pushing it on a level or uphill. As odd as it seems, I can't recall ever having seen one directing a cart downhill before. And then, this guy approaches. At the time, I was surprised he wasn't flying down the hill, given how steep it was. Having looked at the images, now, it looks like he's standing on the wheels, using his feet as coaster brakes. Neat. Near the end of the day's shooting, I was standing by a fire-hydrant and watched incredulously as a car appeared to be silently pulling up to park right in front of it. 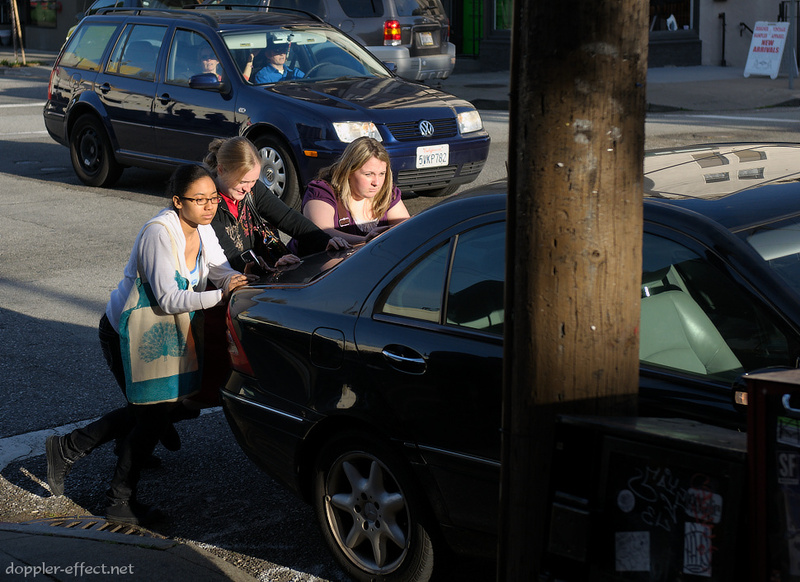 Looking back, I noticed that the car was being propelled by three young women, and suddenly it all made sense. When the car came to a stop, the frazzled driver hit the parking brake, stepped out, and rested her head on her hands, and her elbows against the roof of the car. I asked what had happened and she explained, "the AAA folks said it's probably vapor lock." Oh well. "…You see you wouldn't ask why the rose that grew from concrete had damaged petals… we would all celebrate its tenacity; we would all love its will to reach the sun…"